I finally have read enough books to do another review roundup! I love reading book review posts, although lately I feel like I haven’t been agreeing with a lot of the books that everyone loves. I sometimes think my job as an editor puts me at a disadvantage, because I’m pretty picky when it comes to books. It’s often hard for me to set aside my editor brain and not critique the characters or dialogue or plot. But I suppose that’s the beauty of having our own opinions. 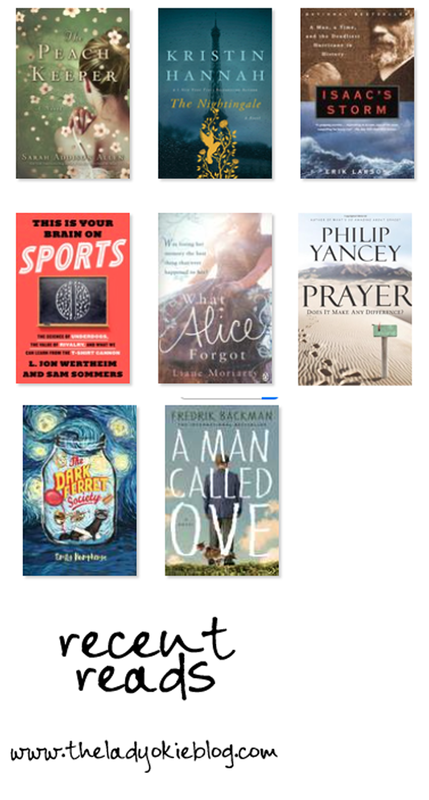 Below are reviews of my recent reads. If you have read any of these, I would love to know if you agree or disagree with me! After being grumpy about Big Little Lies, a few people recommended What Alice Forgot, and I’m very glad I gave Liane Moriarty another chance. I loved this book! It was a quick read that was well written and made me think about my own life and marriage and how I would feel about myself in ten years and where I want to be. I’ve mentioned this book a few times already on the blog. I have been reading this slowly over the past 3-4 months, and it is great. The author dives into answering some of the basic questions we have about prayer in a very real, easy-to-understand way that I appreciate. It’s changed the way I think about prayer in my own life. I received this book for free from Blogging for Books, so it's not one I would normally pick for myself, but I thought I would give it a try. It is nonfiction, and each chapter focuses on a different aspect of sports such as why we like to root for the underdog, whether or not the quarterback really is the “prettiest” guy on the team, and why we get so upset after our team loses. It was a quick read and easy to digest. Some of the chapters were more interesting than others, but overall I liked it. It came out within the last year, so all the facts, stats, and references are up to date. I don't know if it will be quite as interesting in a few years when everything is more dated, but for right now it worked. I would consider myself a casual sports fan, and I had heard of almost all the stories and references in this book. *If you would like to read this book, I will send you my copy for free! Just comment saying you want it, and if there are multiple people I will randomly choose someone and mail it to you! This book features a grumpy old man named Ove who is depressed after his wife dies and makes plans to kill himself. However, his attempts keep getting foiled by the family next door—a husband, pregnant wife, and their toddler. It sounds kind of morbid, but I thought it was well written and light while touching on some serious subjects. I enjoyed the story and the characters a lot and think this book would be a great plane/vacation read or just something fun to read before bed. I have two main complaints and one minor complaint: 1. The main character, Ove, is 59, but I would have found it more believable if he were at least ten years older, possibly even in his 80s. Complaint #2: way too many similes. The writing is unique and creative, but there were too many comparisons to paint a picture of the scene that I found it overwhelming at times. Minor complaint: Sometimes it felt repetitive. I would start a chapter and think, wait, did I already read about this? The answer is yes, I did, but the author is telling us again in a different way, which was slightly annoying. This is a nonfiction account of the Galveston hurricane of 1900. As in Larson’s other books, I sometimes feel like there is a bit too much information, but overall I enjoyed this book. I had little knowledge of the Galveston hurricane before this, and it was interesting to read about. My main critique is probably that I didn't feel like Isaac was a very big player in the book at all, especially considering the title. But perhaps that is the point. His role in warning people about the storm was built up over time, even by Isaac himself, and Larson's findings tell us that he was just as unaware as everyone else. As far as nonfiction writers go, Erik Larson is one of my favorites. He makes these stories come to life, and his list of sources and careful details are evidence of hours and hours of research. Almost everyone I know absolutely loved this book, but I'm conflicted about how I feel about it. It's well written and kept me up at night reading way later than I would normally be awake, so that's obviously saying something. I have never read a book specifically from the point of view of characters living in Occupied France during WWII, so that was interesting (and horrifying, because the conditions were awful). I can't put my finger on exactly why I didn’t love it, but there was something that kept me from totally losing myself in this book like I did in, say, All the Light We Cannot See or a few others I've read that are set in this time period. I felt like the story was a little too rushed, and some things I had a hard time totally believing. I did tear up a bit reading the last couple of pages. Overall I did like the book, but I didn’t love it. This was a fun book by debut author Emily Humpherys. Full disclosure, Emily and I are friends from college! I bought this book to support her writing career and to check out the story she’s been working on. It is such a huge accomplishment to write a book, and I am excited for her! The main characters are high schoolers who are part of a secret society that pulls pranks at school. The characters and plot are creative and this would be a good book to take on vacation or if you needed an easy read between denser novels. I think this would be especially fun for a younger audience. I did notice some grammatical errors throughout, and I found it hard to suspend disbelief during some of the scenes with either the way the characters were acting or the plot itself. However, overall I liked the message of the story and thought she did a good job leaving the ending open for a sequel while still giving this book a nice conclusion. She is working on book #2 in this series right now! I have never read anything by this author before. This book was perfect for what I needed it to be: a good road-trip read, quick and easy but enjoyable. The story itself was kind of strange, and normally I would probably have more of an issue with some of the way plot points were fleshed out. Or, I guess I should say how they weren't fleshed out. There was a mystery, but it wasn't the focus of the story, and it was "solved" rather quickly. I also didn't feel like the way the characters acted was completely believable. But, again, this was a great vacation book and it kept me entertained on our recent 13-hr drive to Chicago. If you want something with depth, this isn't the book for you. If you want a quick read with an interesting setting and a plot that you will probably be able to guess before it's over, you might enjoy this one. p.s. Want more book reviews? Michelle and Kristen have great ones! I felt the same way about Big Little Lies and What Alice Forgot! WAF was probably my favorite thing I read last year. I recommend it to every. one. so I'm glad to see it wasn't just me who though it was exceptional!! I'm so glad you liked What Alice Forgot- I've gotten really burnt out lately trying to read for Blogger Book Challenges, so I picked it up as a (hopefully) lighter, chick lit read before I dive back into the heavy, and non-fiction stuff! I wasn't a big fan of Big Little Lies either so maybe I will give What Alice Forgot a chance. I would LOVE to read This Is Your Brain on Sports! Have a great weekend. What Alice Forgot is great! I didn't like her other books so much though. I haven't read any of the others on your list but I'll have to give them a try. I dont know why The Peach Keeper looks familiar to me - I need to see if its in my library. Glad you gave What Alice Forgot a try - I love that book. I also really enjoyed What Alice Forgot, although I found the ending just a little too convenient. ;) I actually like everything from Liane Moriarty because it's just so easy to read. I would definitely love to read This is Your Brain on Sports. I went to grad school for sports journalism so I know this would be right up my alley. Have a great weekend! I'm glad you liked A Man Called Ove - it's on my to read list since I've heard good things. It's nice to have a "real" perspective on it too. And yay that Moriarty redeemed herself! I've read a few of her books and have liked them all. I just read What Alice Forgot for my book club. We meet next week so I'm anxious to have a discussion about it!! Definitely adding some others to my list! I enjoyed both The Nightingale and Dark Ferret Society. I thought parts of both of them were a bit far fetched, but I certainly missed reading them when I was finished. I'm interested in A Man Called Ove and What Alice Forgot. And our small group is actually considering studying Philip Yancey's Prayer based on my recommendation we take a look at it after I read your thoughts on it a few weeks ago. Thanks so much for sharing! I always find your feedback on books valuable! ADORED What Alice Forgot. It made me reflect on marriage, too! Liane Moriarty is one of my favorites. I recently discovered there are two of hers that I haven't read! Excited to try them - Truly Madly Guilty, and...I forget the name of the other one. A Man Called Ove is on my to-read list too. I'm reading The Bully Pulpit now. T. Roosevelt and W. Taft timeframe. Non-fiction so of course it's taking me forever to get through it. But it's very well written! I've loved all of Liane Moriarty's books! They Hypnotist's Love Story was my favorite. I would love to read This is Your Brain on Sports. Sounds like a fun read! I just finished The Nightingale too, and I think I kind of know what you mean about it since I also had conflicting feelings. On the one hand, I loved the ending, and I thought that there was a great setup overall and a great feeling for time and place. However, some of the deaths in the book I think were underdone, and they didn't hold the emotional weight they should have. I kind of get that that was her point--that they didn't have the luxury to grieve like they should have--but a few more well-chosen lines might have been enough to let us as readers grieve those characters. I always love your book review posts :) Keep 'em coming! oh my gosh we like the same book! high five for what alice forgot. haha. but seriously, you are right - that's the beauty of having different opinions. i don't want to like what everyone else likes just because they like it. i did love the nightingale because the end kicked me in the heart and stomped on it, but at times i was definitely like hurry up, something happen please. i read a lot of WWII books from that kind of point of view, like the European part rather than any other part.. if that makes sense. They always just make me feel all the things. The man called Ove is on my list. I haven't read anything by Sarah Addison Allen, but I have a couple on my list/kindle, I don't think that peach one though. and aw shucks thanks for the shout out at the end! you're the sweetest.